Buying your first pipe is probably going to be the easiest thing you do while learning this great hobby. The reason it’s going to be so easy is because I’m recommending you purchase a corn cob pipe for your first smoke. There are only a couple of different styles to choose from, based solely on your preference, not to mention they are the cheapest pipes out there. You can expect to spend $5 – $10 on a corn cob pipe depending on the style. Corn Cob pipes are great because they require no break-in and therefore will provide a great smoke with little to no experience. If, however, you so choose to go straight to a briar or meerschaum your choice will be a little more difficult. Now you have to decide between a brand new pipe or an Estate Pipe. An estate pipe is a great choice for a beginner. These are pipes that are pre-owned and have probably been broken in. Most tobacco shops will take estate pipes as trade-ins then clean them up and sell them for a small profit. If you can’t find an estate pipe that you like the next obvious choice is a new pipe. Either way (new or estate) you should expect to pay between $20 – $75. You’ll want to heavily consider some of the higher quality pipes made by Bari, Peterson, Nording, GBD or Stanwell. They all make quality tobacco pipes. Whether you chose to go with a new or estate pipe there are three things you’ll need to consider before purchasing: aesthetics, pipe quality, and price. There is a good chance if you stick with pipe smoking as a hobby that you’ll have your first pipe for the rest of your life. You may even pass it down as a family heirloom. That’s why you want to make sure it aesthetically pleasing, in good working shape. Let’s discuss each of these aspects in a little more detail. If you gave your wife $1000 to go out and buy the best pipe in town and she came back with a pipe you didn’t like, chances are you’re not going to smoke it. You’ll come to find out that a pipe is a very personal thing. The biggest factor in purchasing a pipe is that you like it and maybe even love it. Be one with your pipe. So that’s pretty easy huh? Just find something you really, really like. Well, naturally your next question is how do I know what I like? Well, your first impression when seeing a pipe for the first time will tell you a lot. If you see it and you like it, pick it up and try it on. Yes that right, strike a pose in front of a mirror and see how it looks. Does it still appeal to you? It’s almost like buying a pair of sunglasses. Looks cool on the rack but not on your mug. Remember when I recommended you purchase a corn cob pipe as your first? If you spend an extra $10 you can buy 2 or 3 different styles of corn cob pipes to get a feel for what you like. They are all going to smoke a little bit differently. Now when you go to buy your briar you’ll know exactly what you prefer. One last thing to keep in mind. Think Sherlock Holmes or Mark Twain. 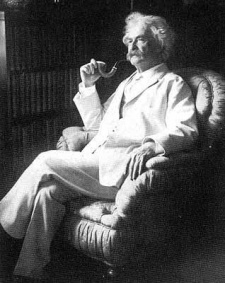 In the case of Sherlock Holmes, he sports a pipe that is way over-the-top whereas Mark Twain selected a pipe in keeping with his particular character. Since pipe smoking is more a weekend hobby for me I tend to go with pipes that are over-the-top. Once you’ve found a pipe that you really like, you’ve got to make sure that it’s in good shape. Pipes actually have to be constructed in a manner that makes them a pleasure to smoke. Knowing what to look for is only half the battle though. Once you know what to look for, it’s remembering to actually look for it! Here’s a list of things to check when inspecting a pipe that you would really like to take home. Part Alignment – A quality pipe will have a precision airway from the stem to the draft hole which is located in the bowl. Any disruption in the airway will cause turbulence in the smoke stream and will cause the pipe to smoke wet and probably loudly. Occasionally pipes are designed with a moisture trap that does work very well. It really is a matter of preference but is not recommended for the beginner. Fills – When a crack, large hole, or pit is found by the pipe maker it is filled in with putty. These don’t necessarily interfere with the quality of smoke, but rather effect the pipe aesthetically. The putty will note age as gracefully as the rest of the briar and could cause a mottled appearance of the pipe. One last thing to note is that you might not be able to tell just how deep a fill actually is. Filters – A metal insert in the stem of the pipe can can cause condensation which will again result in a noisy, wet smoke. Finishes – Try to avoid varnished or sealed finishes. These finishes can crack or bubble over time, so it’s best to steer clear. Grain – High quality pipes will have a uniform tight grain however this will have no impact on smoking quality. Weight – Try to find a pipe that appears lighter than it should. It really comes down to how comfortable the pipe is to smoke. Draft Hole – Ideally the draft hole should terminate in the center of the bowl. Steer clear from a pipe where the draft hole is halfway up the bowl. Pipes are neither expensive or cheap – they’re either good smokes or bad smokes. Find something within your budget that you like and that doesn’t have any major mechanical flaws. Once you get these new pipes broken in you’ll be the happiest pipe smoker in town. I’ve always wanted to try using a pipe. I’m not sure if it goes well with cigarettes though. In my experience smoking a pipe is a different world to smoking cigarettes. The cigarettes smoker smokes more and under any circumstance and, dare I say it is a jumpier, more driven one. I should know. I once was one! Pipe smoking is more reflective, something that one enjoys for itself rather then does while working as well as while reflecting and relaxing. Cigarette smokers are more likely to smoke more than pipe smokers and thus spend more money on cigarettes than the pipe smokers do on their tobacco. This is because pipe smokers tend to have their enjoyment in periods of ‘time out’, at the end of the day, putting time aside to savour the moment. I would never go back to cigarettes now. The smell alone is acrid and chemical – as one appreciates after smoking a pipe for three or four months. I wish there was a ton of interest in pipe smoking on this blog. Lots of people I talk to say they’ve always wanted to try it, but just never had. I considered running a little contest with a pipe starter kit as the prize. Maybe in few months when google is kind to this site. First and foremost, a BRIAR PIPE, modestly priced. All that pretty/shiny varnish finish, will make the pipe smoke gurggly and terrible. Remove the bowl, gently. Wash the finish off as best you can with hot water and a Dobie-type plastic scouring pad. Air dry overnight. Apply oil base stain like Min-Wax Special Walnut, with a cotton swab. Build up a few coats thick and place bowl somewher to safely dry for a day. It will be tacky and wet the next day and you should question your sanity for doing what you have done. Calm down, son. Take a paper towel and wad it up. Wipe off all the built up stain, right down to bare woodgrain. Shift the papertowel around and use more than a few, if you feel it is needed. Let the bowl dry for two days once completely wiped down to the grain and buffed dry. Now, take the stem of the pipe and rub a PENCIL on the tenon to get it completely lubricated with dry graphite, so the stem does not seize to the shank, cracking either stem or shank. From a wire coat hanger or piece of mechanic’s wire, form a PICK TOOL with a pair of pliers, looping the end of the wire and tying a piece of string to the loop to help grip this tool you made. This will lift unsmoked tobacco in your bowl, and keep the stem orifice open and unobstructed. This is a good time to consider, if your newly purchased pipe has a filter, if you wish to keep the element, or chuck it away and go “bare back”. Personally, I do not care for butane. I prefer any one of my Zippo fuel lighters. At times, when I want “campfire tones”, I will light my pipe with wooden kitchen matches, as they are large enough to burn away the sulphur/chemicals, and light my pipe. Even paper matches are okay. I have even used twigs dipped into a campfire or fireplace, and have even burned the bowl terribly stout by picking up a red ember and placing it upon the bowl to light it. A POUCH of modest price, such as a roll up pouch. Any one of your handy DULL POCKET KNIFE selection, small bladed and use it to eventually remove carbon build up in the bowl when the thickness reaches a nickel’s back, as EASY DOES IT! Don’t gouge holes into the bowl. PIPE CLEANERS, starter kit may use smooth offerings. CUP OF COFFEE or TEA, which ever you like better. This is your cleaning solvent. These are compatable flavors to pipe tobacco. Dip the cleaner (ONLY ONCE!) into the coffee and scrub the inside of the stem and the inside of the shank. If you require more than one pipe cleaner, so be it. A PIECE OF PAPER TOWEL to wipe dry what you can reach, and to twist the ends and make a swab tool to clean and dry the inside of the pipe shank. Now is the time to use your pick tool. Wipe the pick clean with the paper towel. Assemble your pipe. Remember the oil base stain you used? The pipe will taste a bit foul for three smokes, until the oil burns away from the wood grain. After smoking, rub the bowl when cool enough to handle. RELAX! SLOW IT DOWN! SMOKE YOU PIPE EASY! About one month later, you may wish to dab your finger into olive oil and coat the outside of the bowl, shank, and stem. Let it sit for one minute, then wipe clean with a paper towel. This will give a HAND RUBBED OIL FINISH to your pipe. You may also use mineral oil, both are good and safe, as they are food quality. Your pipe will start sweating when smoked. Oil will heat up and turn wet on the outside of the bowl, then go into the wood and bring out the grain quality and dry when cool. A drop of olive/mineral oil twice a year. GOOD PIPE TOBACCO. A pipe maker of tobacconist can guide you, best. Best of luck to you with your pipe smoking journey. Brown Baron: It’s *really* cheap to try out pipe smoking if you’re a newcomer. If you go to a tobacco shop you can get a corn-cob pipe for a few bucks…and not too much more to get some small bags of different blends to try out. I would love a list of different pipe “styles” and why they are called by such names. I’m new to pipe smoking but I have enjoyed every minute of it since starting. could someone please let me know why different pipes are called by different names and why they were given these names. I found this site from google 🙂 . I was trying to see if i could learn how to smoke before i went out and bought a pipe and this guide has definitely taught me everything a beginner could use. I was thinking about starting out with captain black white. Is this a good starter or no? I would suggust visithin a tobacco shop where there is a knowledgable person to guide you to a blend that you will enjoy. I have known pipe smokers that gave it up for a time because they based the flavor/experience on a cheap blend rather than “researching”. Get rid of the filter. It serves no real function, but to condense the smoke and make it very wet. also try slowing down. What type of Tobacco are you smoking? i bought a brand new briar pipe which smokes very hot contrary to older ones I own. does that mean that the pipe is not good enough or that it is a new one and so it needs break in? I have been enjoying my pipes for over twenty years. Unfortunately, when I first tried pipe smoking (thanks to my grandfather) I did not have the great resource as with your very informative site to refer too. I basically had to learn by trial and error 😥 . I gave it up the first time due to severe toungue bite (puffing too hard/wet tobacco) and the second time due to not being able to keep the darned thing lit. But I kept at it and have been enjoying my pipes ever since. I am very glad that you share this knowledge with new smokers so as they can enjoy the pleasures without all the frustrations that many of us had to endure. As a pipe smoker for fifty years I feel obliged to make some comments. First of all-Never ever fill up and light a hot pipe. Keep your pipes dry and clean-use a lot of pipecleaners of good quality. Smoke as slowly as you ever can. Keep tobacco fresh-usually in the original pack-it will be alright for three or four days. Have several pipes-use them as seldom as possible. Do not inhale the smoke-it is stimulating enough just letting the smoke fill your mouth and seep out through your nostrils. Careful when you put the pipe in your pocket-it is very disagreeable to find yourself on fire and it is bad for the clothes. Do not alternate with cigarettes-but an occaisional cigar in good company is OK.
Avoid the too spiced tobaccos, but make an effort to find one you like and stick to it. You can find cheap pipes that are good, but the chance of success is slightly better with an expensive one. For me there is no alternative to briar. very good & solid advices, what a 50 year experience and I’m sure you’ve been living a pleasure life. Thanks for all the good TIPS.. Looks like I found myself a real doozy of a briar pipe in the local shop; The guy actually made it himself; He wanted to try a different shape of the standard briar types your familiar with and actually harnessed it into what looks like a fat bratwurst shape; He said he went to New Dehli in India, and met a local Swami who unfolded this silk blanket to unveil this big beautiful , smooth, gurthy, bratwurst pipe that keeps the shank much cooler when drawing in the tobbaco yet draws much attention to the wandering eye; He said there’s no way about getting around the gurthy bratwurst shape features; He’s tried different remedies, The bratwurst just works the best; He tastefully made the tip into a bulbous shape so as not to offend fellow pipe smokers. He apologized for the fallace shape comparison to a human dong but he said there is just no other way around it. I hope I’m not the only pipesmoker with this particular shaped pipe. Has anyone else seen these New Dehli brat pipes in their local shops? Please let me know. I’ve heard rumors about these “Brat pipes” bieng originally made in the northwest part of India, You said you saw one in New Dehli? That’s very fascinating; I’d like to get the guys info about maybe where I can see one or try it on for size; I’m sick the same old Acorn punchouts the other guys are making.. I want somthing BIG , GURTHY and different….I would like to own a bratpipe and experience the smothness that it draws in from a good cavendish blend….Please give me the Brat…I want it to bring the “Wurst” in me…. I’ve been a pipe smoker for about six years now. I started with a heavy estate briar pipe made by Ehrlich. Then I obtained about a dozen others within the first year trying to find one that suited the tobacco I had instead the other way round. I recommend for the beginner to go to a tobacco store and buy a dozen or so blends. Aromatic, natural, etc. Corn cob pipes arent a ‘bad’ choice for a first pipe but you will probably out grow it quickly. They are however a good idea when trying new blends so as to not give your briar or meerschaum pipe an unpleasant taste that could require an in depth cleaning to get rid of. Also, practice packing your pipe until it smokes easy and smooth. ALways use natural wood box matches, not the paper ones. Butane lighters will give a negative taste to the tobacco if you have to relight a lot. Does anyone have any recommendations for good pipes for women? I’d like to buy my own pipe and have been having trouble finding pipes that are a little less masculine. Thanks! My mother used to smoke a clay pipe, delicately decorated and about as inexpensive as a pipe could be. They are still around from good tobacconists and, I should imagine, via the web. They are very cheap – and quite Irish. Just stumbled on this site and was surprised to see such a long running thread. I began a pipe back in 1964 and tried lots of different pipes, but eventually settled on Brigham [made in Toronto, Canada] and Old Port Pipe Tobacco which I smoked almost exclusively until it disappeared around 9/11. As time passed prices rose until at $18 a pouch, it began to seriously bite into my pension. The only tobacco commercially available seemed to be Sail and Captain Black, neither of which is quite the same as my long lost Old Port. The Brigham Pipe comes in several quality levels but always is fitted with their patented maple wood tubular filter, which I personally like. Now, luckily, I seem to have found a source overseas for Captain Black which brings the cost down by 80% and I am back enjoying my pipe instead of cigarettes. (One of the reasons I tried a pipe in the first place, the price went up to 42 cents a pack!) Anyway, not much more to add as those above have many good suggestions. Hope you’re swell. I tried a pouch of Old Port (mild) recently and found it to be awfully harsh on this pipe smoking newbie’s taste buds. Since it’s been a favourite of yours, I’m hoping you’d know what types of tobacco Old Port is made from. There’s nothing on the pouch nor can I find anything on the Internet about it. If you could assist, that would be great. Old Port is available in Kimberley and Cranbrook, BC (Canada) for around $20/50gram pouch. Ouch, eh!?! That’s about average for most 50gram pouches from local grocery stores that I’ve found (and that carry tobacco – some don’t sell tobacco products at all any longer). I smoked a pipe for the first tim yesterday and was very impressed. Just a $4 corn cob pipe and some Koniack flavored tobacco. Very nice indeed, and I couldn’t stop thinking about physics. I have smoked a pipe for several years and I believe that briar is the only way to go. It can be a cheaper pipe, just pick a sturdy looking one, Kaywoodie has a good selection for under $40.00 or perhaps one of the less expensive Savinelli around $50.00. If a person usd to smoke cigarettes Prince Albert is a nice simple blend to start with. If you like lots of aroma Captain Black White is a good bet. You will discover what you like as time goes on. I’m looking for a little advice as a pipe newbie. I have never enjoyed cigarettes but love a good cohiba. I just bought a Wellbent pipe (I still can’t find any info online about the brand) and started using Borkum Riff cavendish Vanilla – but am not exactly satisfied. As a cigar lover, can anyone recommend a tobacco that might suit? I’v been smokinging for about 3 years now, and since no one around knows much about proper pipe smoking does anyone know how to avoid toungue bite and “wet tobbacco” . I have several Dr. Gabbo pipes which I find pretty good for beginners, they are cheap and not bad looking. Thought I’d also share that for smoking I like a blend called harvest moon, good mild favor. To avoid or get around “wet tobacco” – when it happens while you are smoking, stick a pipe cleaner down the stem or even better, take the pipe apart and stick a pipe cleaner down the stem right into the bowl – let it sit for 5 seconds, then pull it out. Your pipe will be dry. Hold on there a second. Sherlock Holmes smoked a cherry wood churchwarden and a traditional clay pipe. The outrageous and slightly tasteless Calabash was added by a, non surprisingly, american actor portraying him as it was the easiest to balance in the mouth whilst talking. Here, here! Right you are, old man. Rathbone, was best. Brett, excellent. So many others were too “ham”. Come to think of it.., Rathbone and Brett, really were pipe smokers. I have quit smoking cigerettes few months back. I smoke pipe ocassionally. I would like to know which one of the two is more harmful cigerette or pipe? Cigarettes are much more harmful then peoples unless you inhale pipe smoke then its more harmful. i bought a pipe 2 weeks ago and i love it, i used to smoke cigars, but good ones are expensive. I love smoking a pipe so relaxing! I used to smoke little swishers but quit when I was smoking too much and the cigars got digusting (I will never buy fruit flavored tobacco again). I always wanted a pipe, having my grandpa’s collection at home inspired me, and finally bought one spur of the moment one sunday after reading about Marine Corp hero Chesty Puller, an avid pipe smoker. I wish I found this site first! I learnt alot from trial and error, but now have the hang of it. Pipes are so much better than cigaretes. Just choosing a pipe and then a tobacco, and then the art of filling the pipe, lighting it, and cleaning it, is almost as much fun as smoking it. It truly is an art; I like Half and Half brand: tastes good and the coarse cut is easier to pack. Sweetie: Read my posts. You will soon replace that frustrated Avatar with a happy and contented one. I have been thinking about starting to smoke a pipe and was researching online when I found this site. It has proven,so far,to be very informative. My question is this,I have aquired an estate pipe,mer???? and was wondering what the proper steps would be for cleaning before I begin. Have you “fired it up”, yet? Most estate pipes are professionally cleaned. You may use a commercial pipe sweetener/solvent, or if you do not have any misgivings of using distilled spirit, you may use 100-proof vodka, or stronger. I use sweetener, followed by brewed coffee. I like coffee having 1/3 espresso bean, 2/3 American brown (whatever is on sale). Read my post, which is several posts below this one, of yours. The most hideous error, is not wiping the entire outside of the pipe with olive oil. If you do not have olive oil, or simply do not care for it, use mineral oil which is available as a laxative and is safe to use. Never use automotive or similar oils. Why use olive oil? Because you have no clue of how many different hands pawed that pipe, and you will soon learn if it was clean. The olive oil also feeds the grain and gives luster to the handrubbed oil finish. Don’t overdo it. Too much oil and the pipe will absorb it and expand when hot, cracking the bowl. Follow my instructions in the other post. Best of luck, with your estate pipe acquisition. Meerschaum, is what I have found. Meerschaum is mineral sea foam. Once oiled, gently rub the pipe with a clean T-shirt piece of cloth. Do not overdo it, either oiling or rubbing or the meerschaum may deteriorate. Old meerschaum dries out and drinks anything with moisture. If it is processed meerschaum, it has risk of disintergrating. Cut block meerschaum holds up much better, though be mindful that it too, is mineral. Is it odd for a 24 years old like me to start pipe smoking? I started at age 20. I am smoking pipes since 1965. So much has transpired; Pipes, tobaccos, accessories… Eventually, we find what works for us as individuals, as pipe smoking is indeed a very personal sport. Most of the more seasoned smokers are in agreement, and when we are not, we bear in mind to hold our comments to another member of our fraternity. In general, try not to let others make a pipe purchase for you, as in my case, this is where “goofier” pipes somehow appeal to the humor of others. A pipe maker or tobacconist, is another matter all together. Speaking for myself, a good piece of briar is the way to go. Wait for the novelty pipes as they tend to be expensive and suited only for display on a shelf, rarely if ever, used. Your tastebuds will change and shift several times over the course of time, so start out with quality tobacco and your tongue will thank you. Pipe tobacco, basically is a global journey so understand your basics before you venture out. Please, relax. You control your pipe, the pipe does not control you. Be the master of your destiny and smoke gently, to savor the tobacco, and how it appeals to you, in that, particular pipe. Read classic literature and your pipe will respond with its own smoking cadence. Slow it down. Let your pipe cool. Keep your pipe clean. I use brewed coffee, black, no sugar. Dip the cleaner only once. Coffee is a compatable flavor to pipe tobacco. If you prefer brewed tea, hey, whatever works for your personal taste (no milk or sugar, only). A piece of mechanic’s wire or piece of metal clothes hanger will keep the shank port unobstructed. I loop the very end with a pliers and knot a piece of string through the loop, to indicate that it, is a tool, and not to be thrown away. A piece of paper towel to wipe the wire clean, then grasp a corner and if you are right handed, twist the corner into a counter-clockwise fashion to make a shank mop. Insert into the shank, twisting clockwise. Do not over do it, as you do not want to break the piece of paper towel. Remove this from the shank, inspect for how it looks to you, then repeat if necessary. Your pipe will smoke itself sweet over time. I dab my fingertip into olive oil and cover the bowl, shank, and stem. Wait a minute, then wipe everything clean with a paper towel. If you have more than one pipe, let this pipe sit and dry itself out, undisturbed. I trust that should you opt to smoke a pipe, the material I have given you will be of value and serve you many years as you develop a pipe smoker’s character. Best of luck, to you all. Many pleasurable years are ahead of you. Thanks for an interesting and informative blog. I’ve joked with my wife when relaxing somewhere tranquil that ‘all I need now is a pipe to puff on’ and she took me to buy one. As an ex smoker I was a little worried about smoking, but now I have one I can see its a totally different type of smoking. I’ve started with a black cherry aromatic blend as it was always such a pleasant smell. I love smoking it too and am keen to try other types. Rarely over the past few years have I seen anyone with a pipe, so was pleasantly surprised to find that a 24yr old work colleague also smokes a pipe. When you decide to venture into the magnificent world of different flavors, be certain that your pipe is as clean as possible. Many times, when I taste for reviews, I will even put the pipe aside for a day or two, in order to let my tastebuds get a rest, and sort of return to a starting point. In my case, I tend to like eating raw vegetables to “reset” my taste, a day in advance. Get to understand pipe tobacco flavors with something tried-and-true, like Prince Albert. From this baseline, you will get to understand flavors. Read pipe tobacco reviews prior to purchasing, so you at least get an idea of what any given pipe tobacco will taste like. Relax. Sip the pipe. Keep the pipe smoking as cool as possible. I like to partially dry out pipe tobaccos for a better flavor. Moist tobaccos extinguishes easily and many relights will blister the inside of your mouth, which is not desirable. See what works best in your pipe smoking world. Best of luck to you. I have a great Dane egg shaped corn cob pipe but when it comes to tobacco I love flavors! But people tell me not to start w/ flavors because it is most likely an aromatic and can smoke very hot. I’ve also noticed people say corn cob pipes smoke cooler. Just hoping you all could help w/ my choice of tobacco. Love fruity flavors and chocolate as well like any woman. When smoked in a relaxed fashion, a corn cob is a nice pipe. To this date, I continue to keep at least one cob, one “Tommy Knocker”, and one cherrywood poker. The Tommy Knocker, I make, myself from a purchased cherrywood. The cob will give a Homony-type flavor to your smoke. If you like barbequed corn, then this will be a plus. Cobs absorb a little better than briar, when it comes to nicotine [Author’s note: Non-smokers must rely on Niocine tablets or Vitamin-N suppliment. They should simply enjoy a pipe.]. If you smoke too fast, the stem of the cob will heat up and become hot and uncomfortable. Here’s the way I look at it, when you purchase a corn cob pipe, you are buying servicable pipe components. Shank tenons are rarely properly aligned. The spot of white glue holding the shank to the bowl will disolve and the shank come away from the bowl. So don’t be shocked. In fact, you want this to occur. It’s a good thing. When the shank comes away from the bowl, use either carpenter’s glue, or Gorilla glue to reattach the shank to the bowl. Hold the shank firmly and twist the stem out of the shank. Throw away the filter. Filters are nice when breaking-in a new cob. Other than that, in my opinion, they hinder proper cleaning and become nest sites for bacteria and other germs. If you wish to continue to use a filter, no problem. In pipe smoking, there is no “wrong” way. Do what you like. You may opt to take a scissor and cut new filters in half, then change them more frequently. Now that the stem is removed, take a pencil and rub th graphite all over the stem tenon. This will prevent the stem from seizing onto the shank. Over time, the pinewood shank tenon (look inside the bowl, see it?) will burn away. You will no longer get the campfire tones cob smokers covet. If you continue to use the cob once the shank tenon burns itself away, you will aspirate hot smoke and possibly red hot embers. At that point, look for a tiny piece of bankrun, or a pebble that fits inside the bowl when dropped into it. Look. You want the pebble to come up to the bottom of the shank orifice. Glue the bottom of the pebble and drop it into the bowl. Position it if necessary. Let it dry overnight. Can’t find bankrun or a pebble? Use a piece of broken terracotta pottery. It even absorbs. Keep a good size chunk of terricotta and wet it, then sharpen your cutlery. The pebble in the pipe bowl will make the cob noticably heavier, but it will smoke great. The pebble heats up, overly moist tobacco steams itself to a smokable condition. The juices run off the sides of the pebble into the heel of the cob and are absorbed into the cob itself. Your smoke becomes much more enjoyable. Flavored tobacco? Why not? Different strokes, right? There are cased tobaccos which are soaked in a flavoring agent, and there are topped tobaccos which are merely sprayed somewhat lightly with flavoring agent during the finishing process. Want a cooler smoke, look for more Burley tobacco. Prince Albert makes very nice flavored pipe tobaccos, as do many other pipe tobacco manufacturers. Think of yourself as the social butterfly of flavored pipe tobaccos and have a little bit to sample from all different makers. I think you may then want to only bring your pipe to half-full, and no more, so to sample flavors of your purchases. The cob will also have 50% material to soak extra amount of nicotine because your pipe will only be half-full. To discipline my tastes, at times I will only take one small pinch of tobacco and smoke it, to get a “read” on the flavor(s). The important things to pay attention to, when smoking your cob are: A) Keep your pipe as absolutely clean as possible; B) Relax. Smoke gently, and sip the flavors; C) There’s no written law that says you must smoke, once you tire. Put the pipe down if the flavors are not appealing or if the pipe needs to cool itself off. I hope this information helps you. Best of luck to you, and don’t forget.., you can even take a slice of apple and rub it inside your cob’s bowl to sweeten it. I used to be a Hunter Extraordinare, and would do this regularly, especially after harvesting game animals, as it makes a very nice after dinner smoke with a corn cob pipe. Are detachable stims a good thing to have? The Pipe I am looking at has one I really like the pice but I also want it to be a good one and not to complicated since it will be new . I am new to owning pipes. So I am debating on starting with a corncob pipe or go for a briar pipe. My brothers both have briar pipes and I like them. However, after reading this article and the ones associated with it. I find myself questioning what I should do. I guess the problem is that I know I like longer, curved pipes. This comes from the days that I smoke cigars. I never liked the hot smoke filling my nose. I have a very sensitive sense of smell. I also am use to using my brothers’ briar pipes; by ‘use to’, I mean that those are the only type I have smoked out of when I have smoked a pipe. So the question that I would like to ask, is it okay to start with a briar or should I start with a corncob? Also are the good, online, stores that I can look for a starter kit? I really have no idea about using a tobacco, all i know is that it is really had a bad effect in our health. If you’re looking for a new pipe – check out a Handcrafted McKie Pipe. Practically, it’s the most well built pipe that I have. It had better instruction on how to break in the pipe and because of that it smoked the best, tasted the best, and didn’t burn nearly as hot. The briar is really high quality. The way that the McKie Pipe smokes and cooks your tobacco is a lot more regulated than a cheaper briar. That gives the tobacco a much better flavor and much more pleasant experience. Appearance wise, it was unlike any other pipe that I had or had seen shaped similar to it. It’s just really cool, a neat pipe. I like to relax, when I’m not on the road ( OTR truck driver ) with a good, strong cup of black coffee. What are your recommendations for pipe tobacco? I’m getting back in the habit of a good pipe after being away for over 20 years.